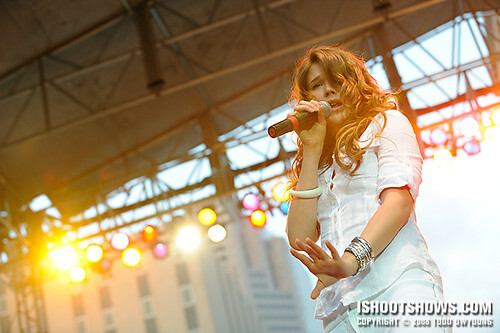 British soul and R&B singer Joss Stone threw down an explosive performance in downtown St. Louis on July 4, putting her big pipes and old-soul moves on display in a knock out show that rivaled the Independence Day fireworks that followed. 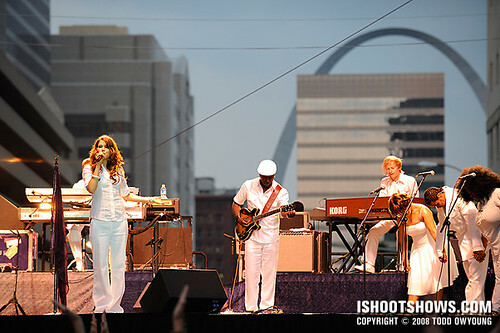 Performing with a backdrop of the city, Stone kicked off the month-long Celebrate St. Louis concert series, which will include performances by Anthony Hamilton, The Black Crowes, and other headlining acts over the next month. 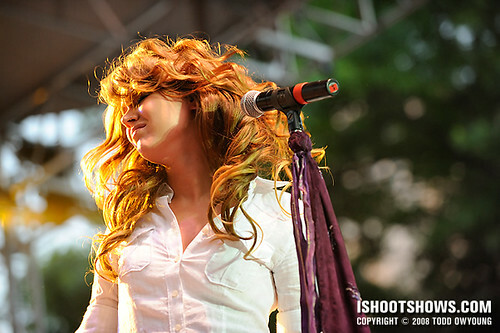 In 2007, Stone's third studio album, Introducing Joss Stone, broke Amy Winehouse‘s record with Back to Black for the highest-charting debut for a British female solo artist on the Billboard 200. Let the record show that the City of St. Louis has celebrated the Declaration of Independence of the United States from the United Kingdom of Great Britain by inviting a British singer to perform during the festivities. I shot this set for the first two songs from the pit, then ran to the back of the VIP seating to snap the above shot. It does seem a little wrong that a Brit was the headliner for our July 4 celebration. I’m guessing they were more concerned with “who can we afford that people have heard of?”. Hey Janet! Ha, perhaps that was the case. Regardless of nationality or last history between our respective countries, I thought Joss put on a great performance. I would have loved just one more song to shoot, but those are the breaks! Great set, really nice work. Have you considered shooting Joss’ next album cover? These are some of the best shots I’ve ever seen of her. BTW – how did you control your highlights with the white light shinning on her? I’d definitely have a crack at her album cover given the chance. Thanks very much for the kind words! For these shots, I exposed for her skintones and let her white clothing blow out as it would (though it’s not really blown in most of these shots). The spotlights on Joss were interesting, because most spotlights actually flicker in both intensity and color temperature. Oh my God, Oh my God, Oh my God… I missed her concert here in Portugal at Rock in Rio… It got broadcasted live on cable but it’s not the same thing. I seen some of the pictures taken there and I’m now seeing yours now and they are remarkable… Not that I’m comparing! Great job Todd! This is a sweet surprise I wasn’t expecting! Glad to hear you enjoyed this set! Joss really put on a great show, I was impressed. Even though I was only allowed to shoot the first two songs, there was lots of variety in her stage performance and she kept us photogs busy by continually moving on stage. jesus! these are insanely tight shots Todd!!! were you shooting with the D3? i am used to reading your notes on your shoots…these are amazing…care to share settings and such? Hey Kenny, thanks for the feedback. I was using the D3, as I do for all the gigs I shoot now. I’ll be picking up either a D300 or D700 later in the year, but the D3 is my main camera body. I was wondering if people would miss the camera settings. Is it really helpful? I shot this set around 1/400, f/4, IOS 1600. Celso, ha. Yes, her summery white wardrobe was a bit different than the red dress Joss sported for that gig you linked. You should try for a photo pass sometime. Even if it doesn’t mean shooting larger gigs right away, we all have to work our way up. I started shooting in tiny little clubs. I’m however trying to find a workaround when they come back from vacation period. It’s kind of good to start at a local club as you don’t have to invest much on fast tele lens. I shot my first club gig with a D70 and 50mm f/1.4, so it definitely doesn’t take expensive gear. If this club doesn’t issue photo passes, do they still ban cameras? the yellow and purple lighting do really make her look much sexier than normal. guess i should give some props to you too todd =)! again, great work and joss has great stage presence which like you said made for a fun gig to shoot. can’t wait to see what you do with ted nugent. 1) fast lens. not necessarily a telephoto, but definitely f/2,8 or faster. 2) high ISO. these small venues’ lighting is not the greatest and it helps tremendously if you can boost ISO levels. it’s definitely been a learning experience which i wouldn’t get if i tried to get into a larger club which requires photo passes. thanks for your advice todd! btw, just wanted to get your thoughts on D300 and D700. i currently shoot gigs with my M8 and D70, but find both are not do not provide clear shots at high ISO so looking to upgrade the D70 to either of the two nikons above. I give Joss a lot of credit, I only pressed the button at the right times. Ted Nugent should be, well, interesting, to say the least. As long as I don’t get a bottle busted over my head during that show, I should be alright. Regarding your points about shooting small clubs, you’re right. A fast lens and high ISO are definite musts for shows like that. Given the choice between the D700 and D300, if high ISO is a prime concern, the D700 is going to be about a stop better than the D300 in this regard. If image quality in the D700 is as good or better than the D3, which I love, it should be able to tackle even the bad lighting of small clubs. I’m contemplating a shift to more general, less tech-oriented coverage, but I’ll take your note into consideration. It’s nice to hear you do read the notes, though. Thanks for the feedback. Wow, I didn’t even know she was in town. Nice photographer comment btw, it gave me a good chuckle and the shots are fantastic. Thanks for the comment. I’d received a press release a while back about this. The turnout for the performance was pretty good. I think the attendance for Saturday’s show with Anthony Hamilton seemed even more packed, but that was probably because I arrived latter for that gig, just before the show. Ah, I see. It sounds like you need to hook up a photo pass through a publication then. The 18-55mm is definitely going to be a liability due to the slower aperture. Todd, Nice. Was she barefoot as usual? Also, a one line spec of your camera settings would suffice. Hey ww, thanks for the comment. You know, I actually didn’t see whether or not Joss was barefoot. Thanks for the info about the settings, too. As far as camera settings are concerned, the more the merrier. I’m a pretty detail-oriented dude, so you would be hard pressed to overload me with data. Of course, I respect and appreciate the time it takes to get the info and put it into the post. As far as cameras go, I’m shooting with a refurbished D80 and a $100 50mm 1.8. Anything above ISO 800 makes me want to vomit, and fixing hot pixels is a real drag, and I swear I have intermittent AF problems as I’ve spent a ton of time figuring out exactly what the CAM system wants to see. But you shoot with what you got. Sometimes I want to smash the whole rig and light the bits on fire, but then I just pack up and go shoot. I’m still learning tricks to pull better images out of what I have. Hey Jason, thanks for the input on the camera settings. I’m going to continue weighing the options and streamlining the presentation if possible. Maybe I’ll have a poll, ha. Oh yes, Joss is super talented. I love your photos of this set! Especially the one with the arch and the band. Thanks, Janet! I knew I had to get at least one shot of Joss with the Arch in the background, thanks for the pick.